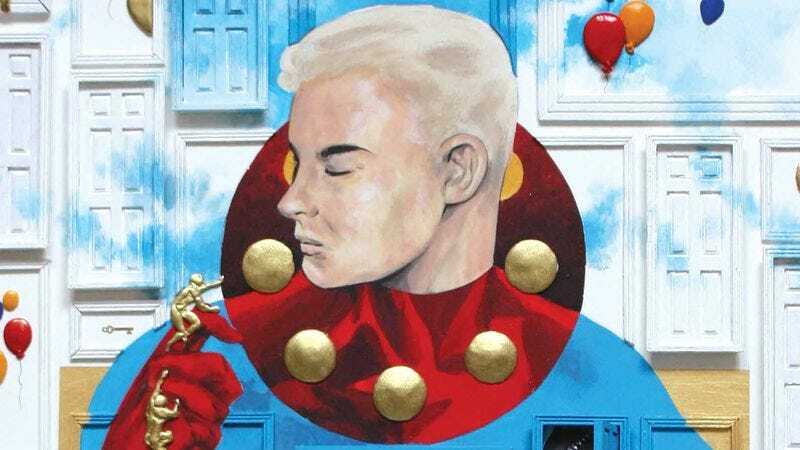 When Alan Moore and John Totleben departed Miracleman in 1989, they left behind a world overflowing with storytelling potential. In the final issues of Moore and Totleben’s run, Miracleman and his godlike allies reshaped the Earth into their idea of utopia, and that rapid transformation introduced a multitude of rich ideas begging for further exploration. Incoming writer Neil Gaiman realized the vast narrative opportunities created by his predecessor, and used them as the foundation for personal stories that offered a more grounded view of this fantastic age of miracles, exploring how the actions of legends have impacted the lives of common people. Joined by the versatile art team of Mark Buckingham and colorist D’Israeli, Gaiman took Miracleman in a very different direction, but one that was still driven by the imagination and ambition that characterized what came before. Those issues had been kept out of print by lengthy legal battles for over two decades, but Marvel’s lethargically paced rerelease of Miracleman has finally reached the point where readers can pick up a collected edition of Gaiman and Buckingham’s initial arc of short stories. There are a few significant differences in Marvel’s packaging of Miracleman: The Golden Age (Marvel) compared to how it approached Moore’s material. Marvel has permission to use Gaiman’s name (Moore was credited as “the original writer” for all of his content), it hired the original colorist to recolor the artwork, and the story-to-cost ratio is much better. The collections of Moore’s issues were padded with behind-the-scenes backmatter that doubled the page count and hiked up the price, and while this new hardcover still offers a look at Gaiman’s pitch and Buckingham’s art process, it provides more of their finished work to make the collection a better value. Written by Gaiman shortly after he began work on his seminal Vertigo series, The Sandman, these issues of Miracleman reveal a comics creator still finding his footing, but willing to experiment with structure and eager to push his artistic collaborators and use their influence to push himself. There are big stylistic shifts between each story, but also within the chapters, most prominently in the mystifying “Notes From The Underground,” detailing the experience of an Andy Warhol clone interacting with one of Miracleman’s greatest enemies in the underworld. The line between critics and creators can get fuzzy in any creative industry, and that’s been particularly true with comics. Andrew Wheeler, editor-in-chief at Comics Alliance, has had his share of scandals and issues to face, but he’s also overseen the publishing of some truly spectacular pieces on the site, and it’s clear that he really loves the medium. Another Castle #1 (Oni Press) is his first real foray into creating the kind of content he usually critiques or comments on. Focused on the story of Princess Misty, a headstrong young woman bored by the obligations that come with her title, Another Castle movies forward quickly, introducing not only Misty’s friends and family, but also her enemies and an entire world rife with magic and prophecy. The story will feel familiar to Tamora Pierce fans, reminiscent of Alanna and Keladry and a slew of similarly headstrong, self-possessed young women in YA books. Unfortunately, Wheeler’s work pales in comparison to those examples. Misty is frustratingly stubborn, even as she becomes aware that her behavior causes issues for her group. When she starts making decisions for the good of a larger group, it feels self-congratulatory instead of selfless. The story briefly focuses on the lives of the people trapped by her enemy, but does not examine why the monstrous women are considered unfit for queenhood, while Misty, conventionally attractive and youthful, is a catch their king just can’t do without. It feels as if Wheeler is falling into the unfortunate trap of equating a strong female character with a female character that acts like a male one, and it leaves Misty feeling one-dimensional, particularly as the people she’s treated terribly forgive her without any apparent issue, their stories sidelined for her own. By the end of the issue Misty’s in a position where she’s cast herself as the human savior of the monsters enslaved by her enemy, another trope that’s pretty easy to avoid that Wheeler gets caught up on. More than that, it’s frustrating to see all the women besides Misty reduced to stereotypes: her handmaidens are panicky and useless, there’s an ugly old crone that kidnaps her, and a gorgon who behaves meekly in the face of both Misty’s brashness and the king’s cruelty. Paulina Ganucheau, who also works on Dark Horse’s Zodiac Starforce, is the ideal artist for this kind of book, especially since she does the coloring herself. Ganucheau does find herself in the strange position of working on two female-friendly books that are both written by men—but that says more about the industry than her. Her skills are on full display in Another Castle #1 with dynamic panels and bright pages, both fights and emotional moments given appropriate heft and weight. Newcomer Jenny Vy Tran does a great job with the lettering, moving the story along without distracting from or competing with Ganucheau’s pop-informed style. Patiently serialized in three parts and recently concluded, K.L. Ricks’ Country Darkness (Hazlitt) is a comic about turning off the lights and running to your bed as fast as you can—how you feel a hollow pang in your gut and a chill on the nape of your neck; you know there is nothing to fear, but you leap across the darkened room to the hermetic safety of your bed. The plot itself is simple—a young woman goes out for a run and is confronted with the eerie quietude that overwhelms early evening suburbia—and Ricks takes her time in telling that story. Country Darkness unfolds in three parts, but each one never exceeds seven or eight pages. It comes in short clips and staccato bursts of pastoral genuflection that Ricks fires off between staid pauses of absolute silence. Her linework is dirty and restless. There are echoes of Paul Pope and Emma Ríos, and even an untrained eye will pick up on a similar devotion to the brush, but Ricks’ lines are more unsatisfied with themselves. They change consistency and weight, and her figures are sometimes well defined and sometimes hyper abstracted; you can see her searching for something, striving toward an emotionally resonant aesthetic. Each panel, even the stillest scenes, refuses to cease its movement, and the result is panels with an internal dynamism and fluidity. These fragmentary images inebriate the eyes, and Country Darkness’ heart beats. The comic itself is living, and the muscles and sinews flex under the skin. The best example of this animation is the rhythm of Ricks’ pages. The first chapter has a consistently familiar rhythm, and Ricks is able to craft a comfortable, known space. Her pages begin with a single wide panel at the top and two taller panels underneath it, but as her protagonist goes outside, the panels open up, becoming larger and decreasing their numbers per page. The second chapter, where a magical realist horror reveals itself, is more inconsistent and Ricks avoids repetition; her panels become more numerous and more claustrophobic. She tightens in on her protagonist’s face and, in long shots, she abstracts that protagonist’s body, consumed by abyssal darkness. Ricks adroitly reflects the mood of the chapter in its page layouts, and her skills as a writer of images are evidently matched by her skills as a writer with images. It’s a subtle distinction, but it’s an important one. Here, Ricks demonstrates that not only can she control the aesthetic composition and emotional makeup of a single image, but in Country Darkness she controls the space between those images as well. For many watching this year’s Academy Awards broadcast, Leonard Nimoy’s appearance as the last honored of the “In Memoriam” sequence was a gut-punch. It was a reminder of a passing that seemed, at one and the same time, too recent, and yet also strangely out of time. Nimoy the actor died last February at the age of 83, but Spock belongs to the ages. With so much attention having been paid recently to that other most famous space adventure saga, it’s fair to say Star Trek has been running under the radar. But there’s another new movie on the way, and—in what is surely a more exciting revelation for established Trekkers—the promise of a new television series in development, just in time to celebrate the franchise’s 50th anniversary this year. Even at its quietest, the franchise has still maintained a presence on comics shelves. The latest series to carry the name Star Trek (IDW) has reached 55 issues. This alone would not necessarily be remarkable, although certainly any series successful enough to reach 55 issues in this market deserves some acknowledgment. Still, the beginning of the latest storyline promises to be of interest for more than merely diehard fans. “The Legacy Of Spock” appears, based on the description, to be setting up a fond farewell, if not for the character of Spock, than for Nimoy’s archetypal performance. IDW’s Star Trek series is devoted to the adventures of the crew of the 2009 reboot film and its 2013 sequel Into Darkness. All the original crew of the USS Enterprise were recast with younger actors, with one notable complication: the original Spock—Nimoy’s Spock—appeared in the new reboot timeline via time travel to interact with the new cast, including his younger self (played by Zachary Quinto). This device provided a sop for longtime fans who were destined to be disappointed with any new series, while also allowing Nimoy to appear twice more on screen, if briefly. “The Legacy Of Spock” takes a step back from the adventures of the new crew, focusing instead on Spock’s unique stature in the reboot timeline. While as a time traveler he possesses privileged information regarding the future that must be safeguarded, he also recognizes that the new timeline has already been changed dramatically by his presence, such that his previous memories are only partially reliable. In other words, he doesn’t quite know what to do with himself—an uncomfortable situation for any self-respecting Vulcan. That he is blamed by many for the destruction of Vulcan in the first reboot film complicates matters considerably.